Fighting crime in a future time! It's C.O.P.S. (Central Organization of Police Specialists), the animated half-hour television show that originally aired in 1988, NOT the live-action show about police-dudes arresting guys with no shirts that first aired in 1989. Geeze, talk about confusing. 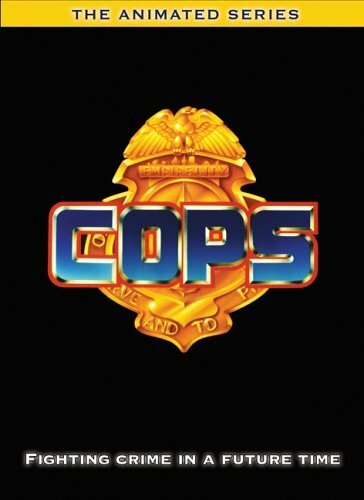 When the animated show was later rebroadcast, they renamed it CyberCOPS to help alleviate this confusion. Now, I remember checking this show out when it first came on the air, but for some reason I just never got into. So when I was offered a box set to review, I thought it would be great opportunity to check out this series once again. And guess what? Now I remember why I couldn't get into it! I absolutely hate the character designs, the voice acting ranges from plain to annoying, the bad guys are idiots (and the good guys aren't much better), and the plots are ridiculous. Yet somehow kids must have gotten into this series because it lasted for 65 episodes... maybe I was just too old for it by that time. Of course, that tells me that this show is really meant for small children, and only small children, because I continued to watch and enjoy weekday afternoon and Saturday morning cartoons all through high school and college. I even still enjoy cartoons today, but that's a different matter now that the Cartoon Network exists. Anyway, C.O.P.S. is about a group of special forces type police officers who protect Empire City from the evil Big Boss and his gang. Episode after episode, this special crime fighting force must constantly stop Big Boss's goons from stealing anything and everything. I'm talking from huge bags of loot and rooms filled with bars of gold to tuxedos and a cake. Yeah, talk about absurd. And if these cops are so good, how come all these crooks are still running around, especially considering how extremely dimwitted Big Boss's goons are? I mentioned earlier that I dislike the character designs. Well, that goes for the vehicle designs as well. Setting the show in the future allows for futuristic vehicles... you know, like a motorcycle with a gun on it, or a car with a gun on it, or a giant circus truck that has a head that extends far into a building so that it can chomp on gold bars and have them flow down a conveyor belt housed in its extending neck until it gets to the body of the truck... or a blimp. How much thought was put into this show? It soon becomes clear that this show isn't meant for anyone over age 8, as there is practically zero character development, the animation is pretty simplistic, the voice acting is comedic, and the schemes in each episode are just ridiculous. Of course, that may be just what you're looking for, in which case you should run right out and grab this set. For everyone else, even the extra features like concept art, storyboard-to-screen of the opening title sequence, and some public service announcements can't save this box set. C.O.P.S.- The Animated Series is being released by Shout! Factory on DVD starting February 28, 2006.